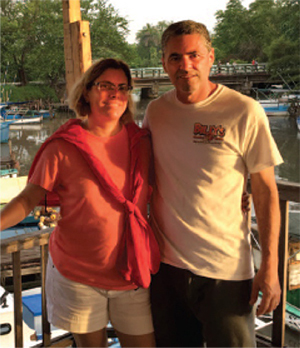 While only 90 linear NM separate Key West from Havana, Cuba seems worlds away in terms of culture and politics, but according to Jim and his family who cruised aboard their PDQ 34 Thing 1 Thing 2, it is well worth navigating through bureaucratic hurdles and regulations to get to. 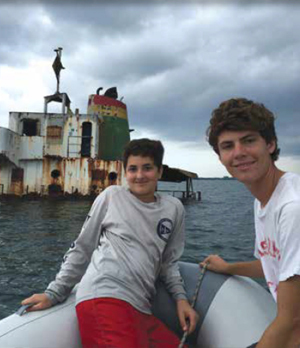 In June of 2016, Jim, his wife Cuqui, and two boys, Nico and Andy, travelled there as tourists and as journalists to write a series of articles for PassageMaker Magazine that was published in a 3-part series. We got our hands on those articles and want to share their experiences, observations and tips about cruising in a world that has, until recently, been cut off from most us. "Cuba is a country of startling contrasts, starting with capital city Havana and its anachronistic 1950s-era cars and tourist-friendly attitudes. The Cuban countryside is another matter, however, where tourists rarely venture and the need for a despacho (official permission) before going ashore or making/breaking an anchorage is required at all times. Cruising Cuba is like combining two trips in one: There is the culture, history, and intrigue of Cuba, with the near-Hollywood romance of Havana, beautiful Caribbean water, and pristine beaches. Then there are the uninhabited islands and stretches you would expect to find in the most remote Bahamian out-islands. Our original plan had been to spend a few days in Marina Hemingway, then cruise west along the north coast to Cabo San Antonio and continue on to Maria la Gorda at the western tip. After that we would steam to Isla Juventud to see at least a piece of the south side of the island. There was so much to see and do, that we ultimately had to make the decision at Maria la Gorda to return to Florida via the Dry Tortugas." "There are a number of deepwater pocket bays along the coastline west of Havana, with many protected anchorages and a variety of towns and small fishing villages. The reef Archipelago de los Colorados extends nearly the entire length of this portion of the coast, usually no more than three miles offshore. Numerous, typically unmarked, channels dot the reef, permitting passage across it. These passes, illustrated on the better charts of the area, are clearly visible in moderate seas and aided by clear skies. Islands inside the reef provide protected anchorages during inclement sea and wind conditions. You will have two options to traverse this portion of the Cuban coast. One is the shallow-water route between the mainland and Las Islas de los Colorados. The second is the deepwater route that lies just outside the barrier islands and the reef. We chose the inside route due to our 3-foot draft, and our enthusiasm to take it slowly and stop to see the small towns along the way. Our plan was to anchor out each night, as we had already been advised there are only six marinas in all of Cuba into which foreign boats are permitted entry." Advice for those looking for a Cuban cruising adventure. "Cruising Cuba is an amazing experience but to do it properly requires significant amounts of preparation and planning. You must prepare to be completely self-sufficient in terms of boat maintenance, provisions, fuel, water, communications, and emergencies. You will go days without seeing a single cruising boat or even a boat with a propulsion system other than two oars and a fisherman. VHF radios are useless, because there is no one to hear or respond to calls. Your cell phone will not work in most parts of the country and is prohibitively expensive when it does work. Access to the Internet and email are infrequent. You are unlikely to find a mechanic along the coast other than in the major cities, and even if you do, you will likely not be able to find parts. There is no commercially available weather information. The fact that you, someone you know, or the author of your cruising guide was permitted to go ashore in a particular port has little bearing on whether you will be permitted to disembark, regardless of the reason or your perception of the importance of your reason. There is no commercial towing service. There is nobody to respond to your EPIRB in an emergency. You must have the ability to travel at least 150 miles safely between fuel stops. You must be comfortable leaving your boat at anchor or your dinghy at an unguarded dock. On the other hand, if you are willing to go it alone, the rewards are abundant, such as the opportunity to see a country that is largely forbidden to Americans and to see parts of it that even Cubans and other foreigners have not seen. It is also an opportunity to interact with some of the nicest, most helpful, and resourceful people you will ever meet. Here are a few hints to make your trip safer and more enjoyable." If you will be in Cuban waters more than 14 days, you will also need an export permit from the Bureau of Industry andSecurity (BIS). The purpose of the BIS license is to ensure that the government is comfortable that your boat will not be used to import or export illegal cargo of any kind. The license generally takes about 30 days. The first step is to apply for a SNAP-R account at www.bis.doc.gov. The OFAC and BIS licenses must be issued, not just applied for, before you are permitted to file for the Coast Guard license, so begin the process early. 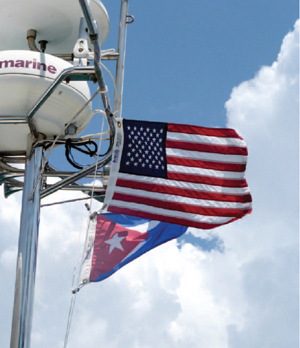 Please note: Entry/Exit rules and regulations to Cuba for US documented vessels may change at any time. Please make sure to review all relevant regulations before planning your trip.